A tight friction based connection keeps this chimney cap securely in place, providing excellent long term chimney flue protection through all weather types. No assembly is required, and installation is simple with no tool use required. HomeSaver includes a lifetime warranty on the cap's stainless steel materials and workmanship. Prevents against flue damage caused by water, debris, and pests. Available in a variety of sizes, this unit is intended to protect eight inch diameter vent pipe. 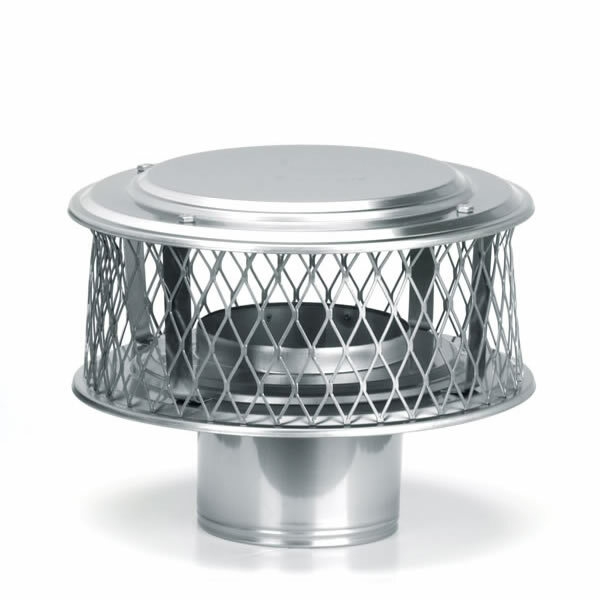 What is the weight of this HomeSaver Guardian 8 inch diameter 304-alloy chimney cap? The published weight is 4.8 pounds. Awesome quality. Sizing excellent. Would buy again if needed. I received expert advice and got the right product for the job. Installation was easy and I am happy. The chimney cap is well made and reasonably priced. I got valuable advice from one of the experts in selecting it for my needs. It is made from stainless steel, which is essential if you use it a lot. Thank you for this good experience. Durable well made product. Dimensions were accurate making installation achievable without modification. ProsStainless steel with no scarp edges. We have not had an occasion to burn in our stove at this time, but the construction of this chimney cap and ease of installation is all very good. At this point I am fully satisfied with my purchase. ProsDesign makes for quick and secure installation. ConsI would have appreciated an instruction sheet on how to install the cap because I had never done such a replacement before. the chimney cap worked perfectly on our older home fit great and has withstood several high winds. was extremely easy to install. Easy to install, great Item!!! I ordered the flu cap and my son-in-law installed it. The flu itself is older, still-no problem. Now, no more leaking water because we lost the old one in a windstorm, thanks!!! I was impressed with this cap, only problem I had was the edges were a little sharp and I did get cut. This cap actually exceeded my expectations. Great quality product, fit as it should. Had a couple fires since I installed it and now have no smoking issues as we had with the old, restrictive cap. This store had the best price for this cap hands down. I am a happy customer! ProsGreat quality, great fit, great performance. We will gladly recommend you to our friends and neighbors. We have been so pleased with our new purchase. The chimney cap was an excellent fit for the metal chimney flue. I had to rebuild the entire top of the chimney an there were 3 different diffuser pipes that had to be covered and joined together. The 8" cap enabled me to do that with perfection. The client was totally satisfied with the end result too and that makes it even better. A great fit and a great product. as was advertised! My use for this chimney cap is different from most. I need it as a cap for a steam stack from an evaporator. I am very pleased with the quality of this product and it will serve my purposes very well. This product is made very well and I am very satisfied. Wow! This was amazing to have my new product on my doorstep in just two days! I am thrilled!